Anthony Shadid, the Pulitzer-Prize winning New York Times foreign correspondent and Beirut bureau chief, died in Syria on Thursday of an apparent asthma attack. He was 43. Shadid's final piece for the Times, published on Feb. 8, was about the current chaos in Libya. Times' assistant managing editor Jim Roberts called it a "death in the family." He was referring to the Times' "family," though he could have been talking about the broader world of journalists—foreign correspondents in particular. The outpouring of grief and remembrances from Shadid's friends, colleagues and admirers has been truly remarkable. We'll collect just some of them here. He wrote poetry on deadline. Yes, a poet, but first and foremost an incomparable witness. Anthony died as he lived--determined to bear witness to the transformation sweeping the Middle East and to testify to the suffering of people caught between government oppression and opposition forces. Heartbroken, but inspired by the outpouring of admiration for Shadid in so many languages and places. His work will be remembered. So bitterly tragic that Shadid, who risked so much to report from Syria and other perilous places, died of asthma of all things. All of us, from the President on down, are greatly saddened by the news that Anthony Shadid died while reporting in Syria. He was one of the best foreign correspondents reporting today. [It is a] tragic loss to journalism, the New York Times, and, most importantly, his family. Our thoughts and prayers are with his family. I cannot think of another reporter whose work so perfectly embodied everything journalism should be. Unparalleled excellence. Rarely does a journalist die and the world is different, but without Shadid we will know less, and settle for less nuanced, less human truth. The flag of international journalism flies at half-mast for the great Anthony Shadid. Oh Anthony, but we just spoke. Can't be true. Is it? Hugged Anthony last nite. He was excited to go to Turkey & write his stories. Heroic reporter, writer. Monumental loss. Condolences to family. Such a brave and smart reporter. A terrible loss. My thoughts are with his family and friends. Horrible loss for journalism and for the pursuit of truth. Deepest condolences to friends + family. I am absolutely crushed by this news. I worked side by side with Anthony Shadid at the UW's Daily Cardinal in 1987-89. Condolences to the family, friends, and colleagues of Anthony Shadid, New York Times journalist and a star of his profession. Heartbroken by the loss of the NYT's Anthony Shadid in Syria. One of the world's bravest and best journalists. In his pursuit of stories in war zones--stories he believed needed to be told--Shadid risked his life many times, and almost lost it several times. Shadid ... was over the last decade or more the most intrepid, empathetic, fully engaged correspondent working in the Middle East for American audiences. He had many gifts and was an exceptionally graceful, easy, and generous man, but among the qualities that distinguished his work was the sheer commitment of it. I feel a horrible loss of a dear friend. I had long planned to visit him at the restored house in Lebanon, and listen to his unassuming but sure to be brilliant impressions of the Arab Spring, which for Anthony was the story of his life. With no hyperbole, I feel almost as much sadness for the world that it is deprived of such an intrepid storyteller, faithful reporter and enthusiast for America and for the Arab world. I wonder who can ever take his place. 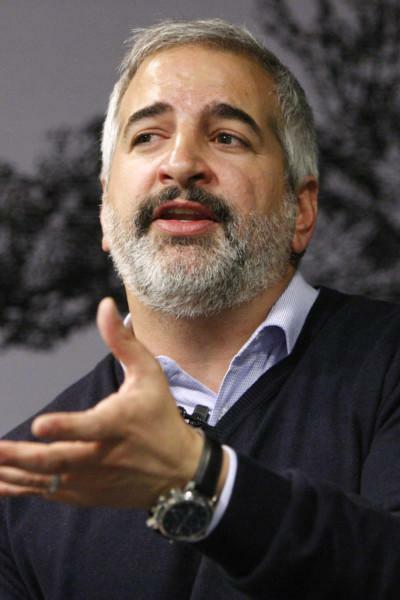 Anthony Shadid never seemed to be in a hurry. If you needed him, or simply wanted his company, he would linger to chat and fix you with a gaze that defined undivided attention. He gave the impression that nothing was more important to him than whomever he happened to be speaking to, even if he had a dozen deadlines. So sad to hear that my friend Anthony Shadid, whose stories made me cry, has died in Syria. I'm sure that I am only one of hundreds of people who thought of him as a friend. He was that kind of guy. I certainly didn't know him half as well as I would've wished. I always thought we'd have time. I miss him already.